Bramell, Party of Five: How cute! Becca and I made this picture this morning while looking at Sprout online. So CUTE! 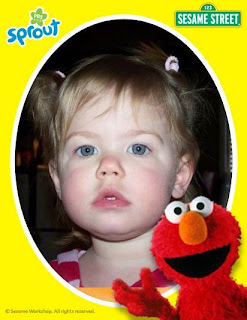 Of course, she was upset because they didn't have Ernie's photo, only Elmo. So adorable! She is growing so fast. Can't wait to see you guys soon. I am going to try to come by the office this week!